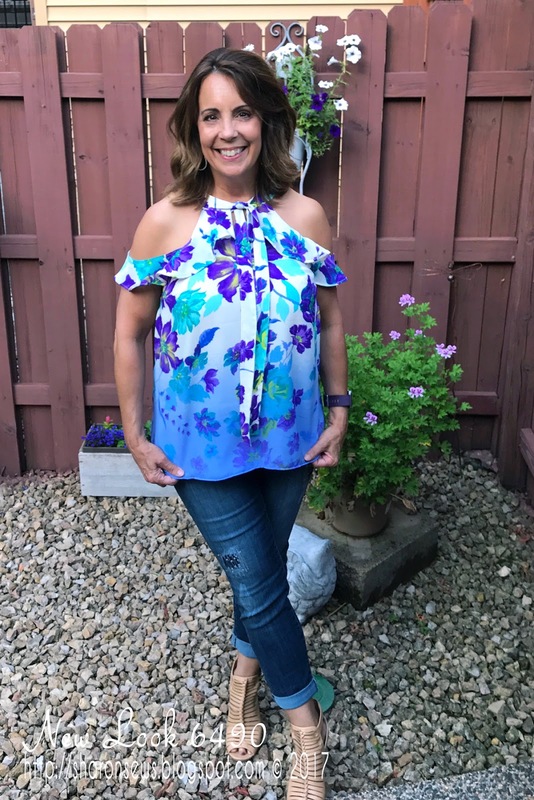 The thought of combining three trends - floral print, ruffles, and a cold-shoulder - sounds like a hot mess doesn't it? But it works! 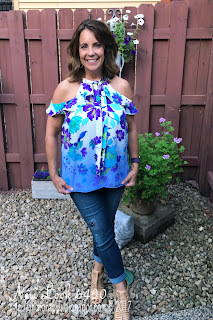 I'm wearing New Look 6490, a pullover, lined top pattern that has options for cold-shoulder, no shoulder, long or short sleeves as well as a ruffle or no ruffle. I choose a floral print purchased June 2016 from Craftsy, when they were still selling fashion fabrics. The 2-yard pre-cut floral ombre fabric cost me less than $10 and provided just enough fabric for this top. Since the darker color was on both selvage edges, I cut the front and back cross grain so I could take advantage of it at the hemline. I sewed view D, the version with the ruffle that extends from the front to the back neckline forming a "sleeve". Here's the front. The neckband and tie front are both interfaced. The instructions call for all four pieces of the front band and tie to be interfaced. I used a very lightweight interfacing (Pro Sheer Elegant Light from Fashion Sewing Supply - no affiliation, I just love the product). I think it worked okay on the neckband but the tie isn't as flowy as I'd like. If I were to sew this again, I'd wouldn't interface the facing section of the tie. I wasn't very good at turning the neckband edges under so it's not completely even all the way around. But it's difficult to see, especially since my hair covers the band. 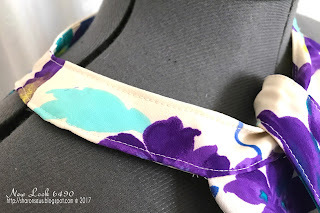 The instructions have you attach the front ties to the neckband, sew the top edge, continuing on to stitch all edges of the tie, and ending at the slit at the front. 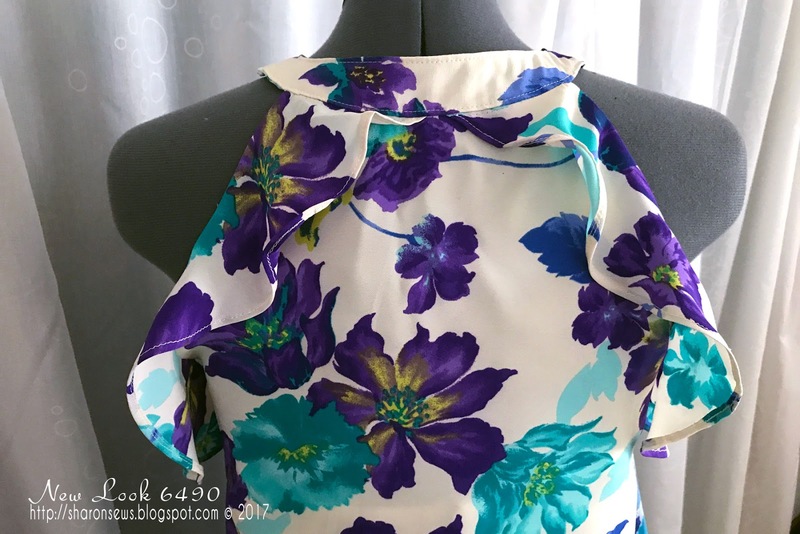 Next you trim, clip, turn, pin the turned under raw edge to the neck band and topstitch in place. I choose to slipstitch the facing in place before topstitching. The front and back are cut on the fold with a small slit front opening. The front ruffle is supposed to hang free, but I misread the instructions and sewed it into the front slit seam. No biggie, it works fine. The edge is neatly finished with a lining. 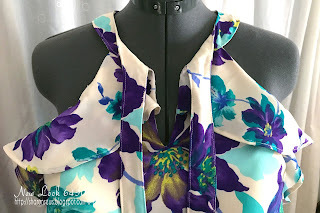 I used a rayon Bemberg lining that I had in my stash. It feels heavenly against my skin. 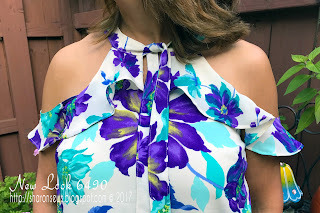 The ruffles are finished with a narrow hem. This is how I do my narrow hems. I changed to a straight stitch throat plate for this step. 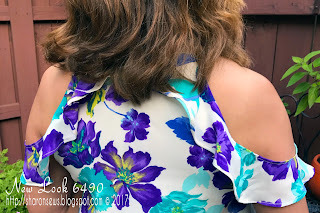 I need to press the narrow hem in place again as there's a few places on the back ruffle where it doesn't want to stay flat. 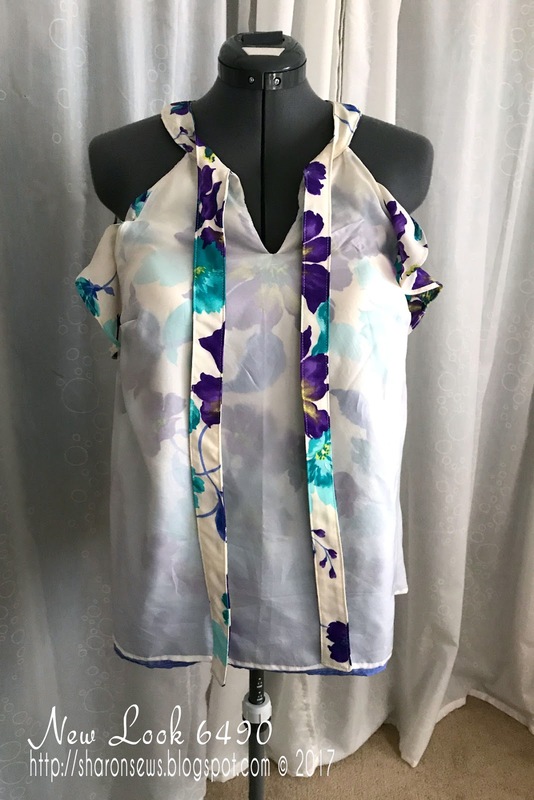 The only alteration I did to the pattern was an FBA. You really can't tell from the pattern envelope that this top has darts. Since there were already darts, doing the FBA was easy. I love the look. I also like that I was able to combine three things I love (florals, ruffles and the cold-shoulder) and not have one trend overwhelm the other. 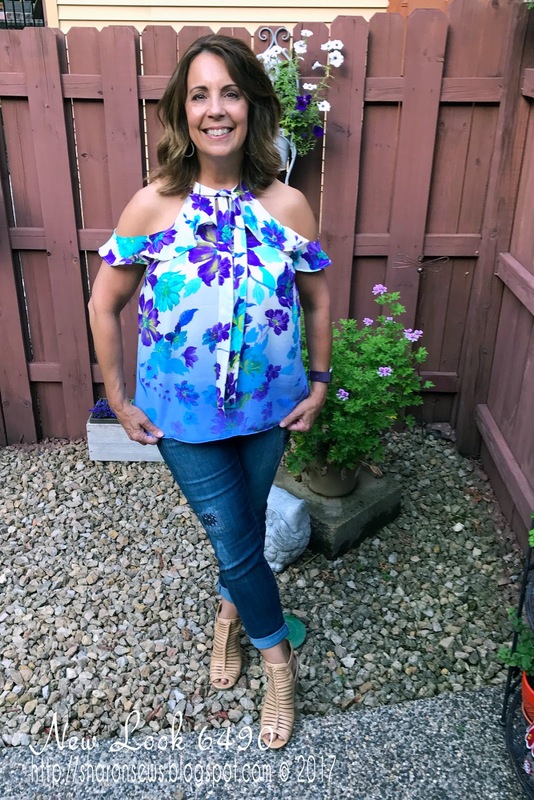 Will I sew it again? Probably not. But I will enjoy wearing this one! It's absolutely gorgeous! 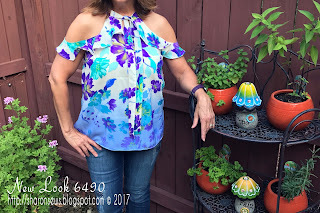 I loved this pattern when I first saw it and your finishing is lovely! What fun. The print you used really makes the top pop! I love this on you! Beautiful combination of fabric and pattern.